Geofabric and Tough-Liner are the first linings in the trenches. 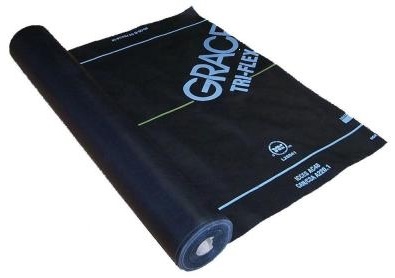 The geo-fabric provides a slight cushion against any rough edges in the soil. Line the bottom of the complete footing. It is best to use 5' wide geo-fabric. With the trench being 4'5" wide this will give an extra 3.5" curl up at each side which is good. Tough-Liner is any suitable tough membrane and it provides just another protection membrane to keep out termites and other undesirables. In order to provide extra termite protection, lay a strip of Tough-Liner along the bottom of the footing trench. The trench is 4'5" wide and typical Tough-Liner is only 4' wide. You should position it on the outside of the trench (against the outer Form-A-Drain. This leaves 5" on the inside of the trench not covered. Use 2" wide double sided tape on the inside of the Form-a-drain (2"-4" pieces every 18") to hold it in position. The Tough-Liner is typically 4' wide. The top edge of the Tough-Liner comes to the top of the Form-a-drain. On the outside of the trench this will provide about a 4" overlap into the bottom of the footing trench. The Tough-Liner on the side will overlap on top of the Tough-Liner in the bottom of the trench. This lines the inside of the footing trench. It is slightly different in that there is a filter sock over the inner upper Form-A-Drain and the vertical distance is less so there will be more overlap at the bottom. Attach the Tough-Liner to the inner upper Form-a-drain with a 4" overlap above the top of the Form-a-drain. Assuming 4' wide Tough-Liner there should be about 1'2" after the fold at the bottom. This extra will cover the 5" of uncovered area at the bottom of the footing trench and also provide a 9" overlap with the Tough-Liner at the bottom of the trench. On the inner upper Form-a-drain, the attaching is done using 2" - 4" lengths of double sided tape every 18" along the top of the sock covered Form-a-drain. The Tough-Liner on the side will overlap on top of the Tough-Liner in the bottom of the trench. Where there is a convex corner you will need to cut the horizontal edge of the vertical Tough-Liner . This will expose some soil area. Cover this area with a 2'x2' patch of Tough-Liner that you tuck round the corner. After installing the Tough-Liner if you expect heavy rain it can be a useful to put back the 4'5" spacer wood as a precaution against movement.